The Federal Reserve voted on Wednesday to again raise the key interest rate one-quarter percentage point, the first of three hikes anticipated for 2017. The rate was increased one-quarter percentage point just three months ago, in December 2016. The probable decision, which followed encouraging employment figures in February, marks a turning point in policy. The Fed raised the rate only twice in the past decade; Wednesday’s decision quickens the pace, signaling the potential for more aggressive action as the year unfolds. Preliminary data from the Berkshire Hathaway HomeServices Homeowner Sentiment Survey echo those findings—though to an extent. Just 39 percent of those surveyed would feel anxious if mortgage rates rose, a 5 percent decline from the last survey; 81 percent of homebuyers, however, would feel concerned about the impact of rising rates on affordability. According to Gary Keller, raising the key rate is necessary. At the Keller Williams Family Reunion conference last month, the company’s co-founder and chairman offered perspective by tracing the historical trajectory of the rate. 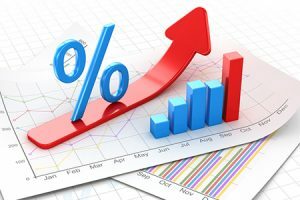 Mortgage rates are indirectly impacted by the movement of the key rate. The 30-year fixed mortgage rate jumped to a year-high last week.